Little Mjolnir Hammer is a powerful guard of your body, soul and mind possessing divine strength of Thor. The hammer is known to serve faithfully to its owner and to always come back to the hands of the owner. Its power was described in myths and legends as all destroying and defeating. It was said, that tis little hammer could even the mountains and defeat any enemy of any power. 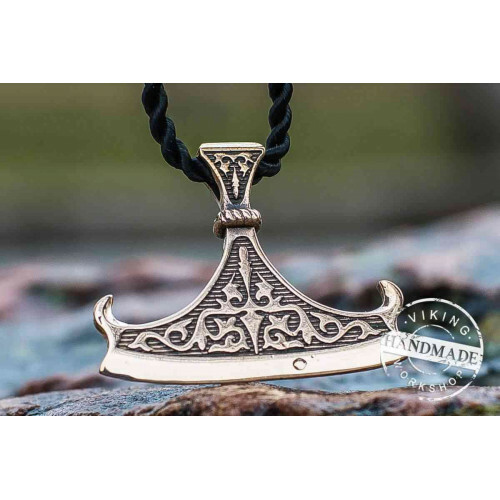 This Thor's Hammer is a handmade pendant made of sterling silver. A gold one is also available in our store. The pendant comes with a cord (the cord may be different from the photo). We offer a large variety of Viking style chains to get a perfect jewelry set. Every item is handmade and is made by order only. We do not use stamping technique for production of jewelry.